Unlike a lot of people I didn’t fall in love with Peter O’Toole from watching “Lawrence of Arabia.” I didn’t appreciate a proper respect of that role until I watched that movie years later and had some maturity under my belt. 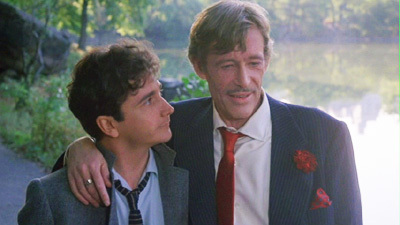 No, my love of Peter O’Toole came from a triumvirate of movies he made during the 1980’s. There was the absolutely brilliant “The Stunt Man” in which he played the deranged and possibly insane but undeniably genius filmmaker Eli Cross. There was “Creator” in which he played Dr. Harry Wolper, a Nobel Prize winning biologist obsessed with cloning his late wife. And the movie we’re going to talk about here; MY FAVORITE YEAR. I link all of these movies as a loose trilogy as in all of them Peter O’Toole plays men of extraordinary gifts, charisma, intelligence and talent. Men who wish dearly that while they enjoy and relish who and what they are, we see glimmers that they aspire to be like everybody else and just be. It’s something I can relate to as I’ve felt that way ever since I was twelve years old. So it’s no wonder I identify with the characters Peter O’Toole plays in these movies as well as in “The Lion In Winter” (a good candidate for the most quotable movie of all time) Sometimes the only reason you’re the smartest and most charismatic person in the room is because everybody in that room leave you no choice but to be so because they don’t try to do so. “The King Kaiser Comedy Cavalcade Show” is the hottest, funniest, and most successful TV show in the era of live television circa 1954. They’ve booked as a guest-star Alan Swann (Peter O’Toole) a near Errol Flynn level star of swashbuckler movies to come on the show. There’s a couple of things getting in the way. One is that Stan ‘King’ Kaiser (Joseph Bologna) is engaged in a legal war with a corrupt union boss named Karl Rojeck (Cameron Mitchell) who is upset at the series of ‘Boss Hijack’ sketches Stan Kaiser has been doing on his show and has taken out a contract on King. If you’ve seen the movie and you’ve seen that scene and O’Toole’s delivery then you’re probably chuckling or outright laughing by now. And that’s because a lot of the time in MY FAVORITE YEAR we’re laughing not just because of what Peter O’Toole says in a scene but how he delivers it. Benjy and Swann spend a lot of time in the week leading up to the show where Benjy has to keep Swann sober. And in that week they both have to deal with family issues. Swann has dinner at the home of Benjy’s mother (Lainie Kazan) who after the death of Benjy’s father married a Filipino bantamweight boxer named Rookie Carroca (Ramon Sison) who is very precise about not only his marital status but the pronunciation of his name. Benjy has to explain to Swann that he changed his Jewish name to the more Angelo Benjy Stone to work in Hollywood. In return, Swann reveals that Swann’s young daughter Tess has been raised exclusively by her mother but Swann has secretly sent most of his money to raise Tess and that’s why he’s broke and doing television guest-spots. 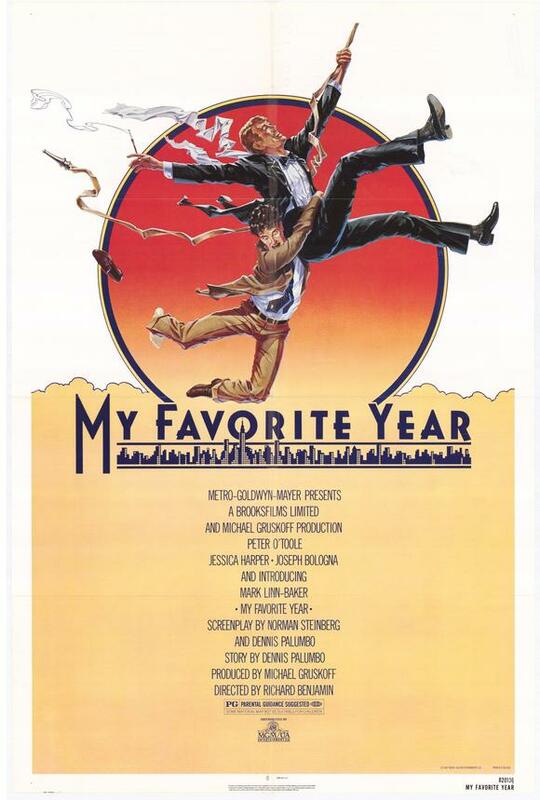 MY FAVORITE YEAR is one of my favorite movies and one I’ve seen maybe forty times since I discovered it on cable and once it was available for VHS and then DVD I purchased it in both those formats. And I still watch it when it’s aired on Turner Classic Movies as they do so fairly often. 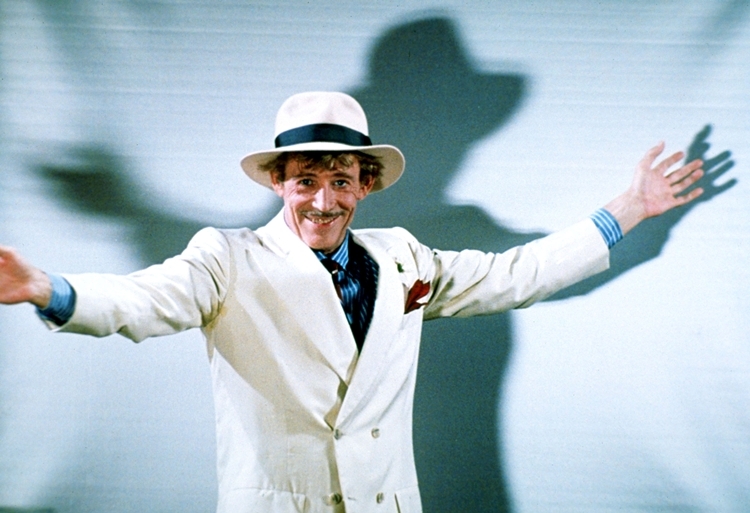 MY FAVORITE YEAR is absolutely hilarious from start to finish and most of that is due to Peter O’Toole. He was nominated for Best Actor in The Academy Award that year and that he didn’t win was criminal. It’s a movie full of heart and truth about who we are and we we pretend to be in public and who we even pretend to be to ourselves. If there’s any acting flaw in the movie, it’s Mark Linn-Baker. He’s our POV character and the narrator of the movie but he’s the least interesting and least likable. It’s easy for me to see why Jessica Harper’s K.C. character doesn’t want to have anything to do with Benjy as Benjy treats the ‘relationship’ they have as a comedy sketch. But Jessica Harper as usual is nothing less than perfect. Joseph Bologna is great as King Kaiser and I like his portrayal of the character as a mix of towering egomaniac and insecure little boy. And I love how King stands up to Karl Rojack in a truly sidesplitting scene where Rojack confronts Kaiser. And I cannot leave off this review with giving major props to Lainie Kazan. This is the woman who was the physical inspiration for Jack “King” Kirby’s Big Barda character and if you’ve ever seen her in movies you know why. So should you see MY FAVORITE YEAR? Yes. It’s a wonderful comedy that you can watch over and over again. Trust me on this. I haven’t spoiled 90% of the laughs in this movie. But it’s also a great human story about heroism, family, personal belief and human strength overcoming human weakness. And it evokes a time in American television history worth revisiting. And it’s a terrific Peter O’Toole movie. And if all that isn’t enough to convince you to watch MY FAVORITE YEAR, I’m done. King Kaiser is a pretty dead-on parody of Sid Caesar and I tend to think Benjy is Woody Allen, though Woody never apparently worked on YOUR SHOW OF SHOWS. I love this flick, too. Doesn’t hurt that my birth year was…1954. I always thought of Benjy as being the young Mel Brooks.